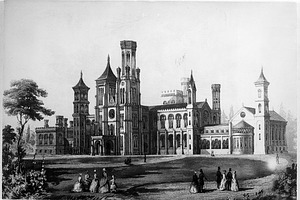 The Smithsonian Institution’s first building, the Castle, was designed by architect James Renwick. Until 1881, it housed all aspects of Smithsonian operations, including research, administration, lecture and exhibit halls, library, laboratories, collections storage, and living quarters for the Secretary. Today, the Castle houses administrative offices and the Smithsonian Information Center. 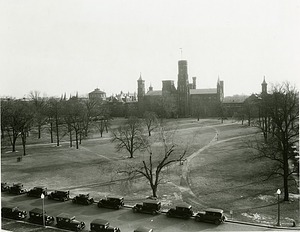 The Smithsonian Institution Building (SIB) seen from downtown Washington, D.C., from across The Mall, around 1855. In the foreground are construction materials along 15th Street, NW for the new wing added in 1855 to the Treasury Building. The Treasury building is the oldest departmental building in Washington, D.C.having been completed in 1842 and expanded three times by 1869. Residential and commercial buildings in the foreground are between 15th and 14th Streets, NW. This area was also known in the 1860s as the red light district called Murder Bay. The canal bordering the Mall before being converted to form Constitution Avenue is the sliver at right center. The white residence at the far left is at the corner of 15th Street and Pennsylvania Avenue, NW. Looking east of a newly decorated Lower Main Hall, or the Great Hall, of the Smithsonian Institution Building, visitors pose in the center. The second floor galleries are clearly visible. The delicate stencil work on the ceiling is by architect Adolf Cluss, who following the repair of water damage in the Lower Main Hall, used the opportunity to enhance the walls and ceiling. 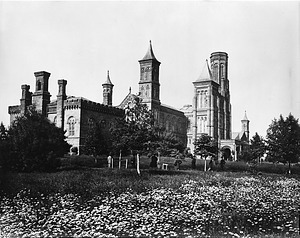 North facade of the Smithsonian Institution Building (SIB), also known as the "Castle," from the northeast, before the fire of 1865, showing people on a path in front of the Castle and a flower-covered expanse along the Mall in front of the building. The first Secretary of the Smithsonian, Joseph Henry (1846-1878) and family lived in the East Wing of the Smithsonian Institution Building. The Music Room of the Henry apartments is furnished with Rococo Revival and wicker furniture. The bust of George Washington can be seen on the far right. People are visible standing around watching the burning of the Smithsonian Institution Building (SIB), the "Castle," January 24, 1865. The photograph was taken and heavily retouched by Alexander Gardner. Prehistoric Archaeology exhibit in Upper Main Hall (above Great Hall) of the Smithsonian Institution Building showing ethnological and archeological specimens, looking west c. 1879-1903. An immense painted Tsimshian housefront, acquired from the Northwest Coastal Indians for display at the Philadelphia Centennial Exhibition in 1876, is visible on the west wall at the back of the room. Numerous busts populate the tops of exhibit cases. Spears and bows and arrows from various tribes are decoratively grouped in patterns on the walls. 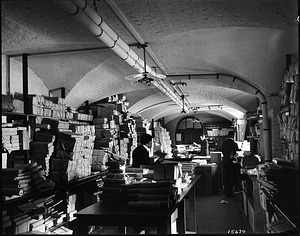 Three staff members of the International Exchange Service are at work in the basement of the Smithsonian Institution Building. Note electric wiring is on ceiling. Wrapped packages are piled on the tables in the center and along the wall. Established in 1848, the International Exchange Service, administered by the Smithsonian Institution, disseminated scientific publications to scholarly institutions both in the United States and abroad. 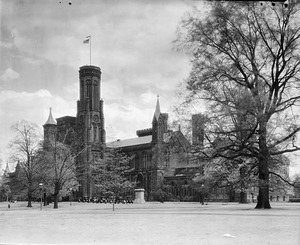 View of the Smithsonian Institution Building, the Castle, after a snow fall in 1903. The statue of Joseph Henry, first Secretary of the Smithsonian, facing the west end of the building, is visible in the foreground. Six cars are parked on a road in front of the Smithsonian Institution building. 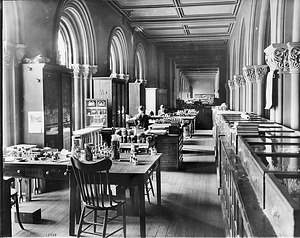 Curators of Fishes and Marine Invertebrates (Crustaceans) and other departments' offices for cataloging and arranging collection specimens located on the former exhibit galleries (north balcony) of the Great Hall in the Smithsonian Institution Building. The balcony exhibit space was replaced by offices beginning in 1882. Specimen jars are on tables and stands. Other scientific apparatus can be seen on the table in the foreground. A woman with her back to the camera is seated at another table and a man appears to be looking into a microscope at another table. The balconies were demolished in 1914 to make way for the Library and Graphic Arts displays. Amelia Fowler was a teacher of embroidery who became involved in flag preservation in 1900. From work for preservation of Civil War flags for the State of Massachusetts, to work in 1912, she and 40 needle-women she had trained on 172 historical flags at the U.S. Naval Academy, Fowler developed a method of preservation she patented in 1913. Fowler agreed to a government contract to do the work on the Star-Spangled Banner. 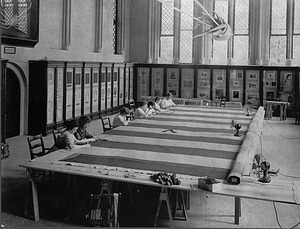 She and her team worked for eight weeks in the hot and humid summer between mid-May and mid-July 1914 in a un-air-conditioned room and sewed on a new linen backing using approximately 1,700,000 stitchesWomen are at work repairing the Star-Spangled Banner on a set of makeshift tables in the room in the Castle then known as the chapel (now the Commons) in the West Wing of the Smithsonian Institution Building. The closing of the West Wing during renovation allowed the hall to be used for this purpose. 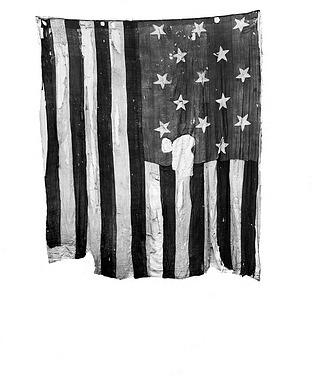 To preserve the flag, a team of seamstresses under the direction of Amelia Bold Fowler used a series of interlocking open buttonhole stitches to secure the tattered flag to a backing of unbleached linen. Electric fans can be seen. All the exhibits have been removed except display cases along the wall and the giant squid hanging from the ceiling. View of the Smithsonian Institution Building and The Mall from the roof of the Natural History Building, now the National Museum of Natural History. The Mall is seen shortly before it is cleared of trees and leveled. On the street are parked 1920s automobiles. 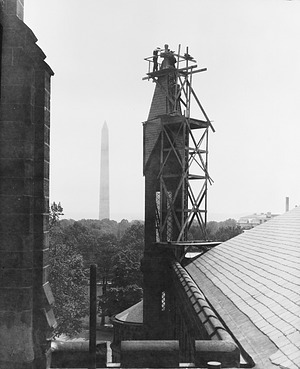 Workmen on scaffolding repair the Northwest Tower of the Smithsonian Institution Building. The Naitonal Mall and the Washington Monument are visible in the background. Located in the basement of the Smithsonian Institution Building is the Division of Radiation and Organisms, a division of the Smithsonian Astrophysical Observatory dedicated to studying the effects of sunlight on plants. Shown here is a corner of the laboratory where histological studies of plant tissues are made. 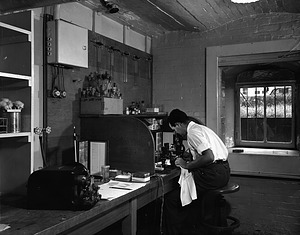 An unidentified man is looking into a microscope. 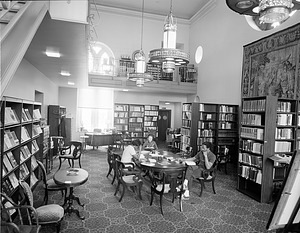 The Woodrow Wilson Library located in the West Range of the Smithsonian Institution Building. 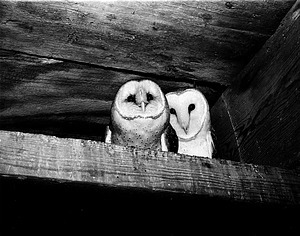 Owls, named "Increase" and "Diffusion", who lived in the West Tower of the Smithsonian Institution Building, perch on a ledge. 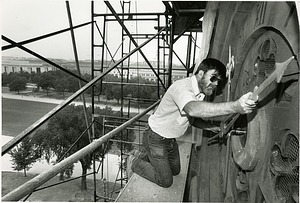 National Museum of American History's David Todd lends his clockmaker's art to the tricky job of refitting the newly gold-leafed hands to the clock of the Flag Tower of the Smithsonian Institution Building. Scaffolding has been erected. The image looking north, shows the National Museum of American History across the National Mall. 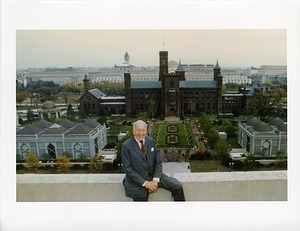 Smithsonian Secretary S. Dillon Ripley sitting on roof of building across from South Yard. Aerial view of Quadrangle shows Smithsonian Institution Building (SIB) or Castle, Enid A. Haupt Garden, National Museum of African Art (NMAfA) and Arthur M. Sackler Gallery (AMSG). The National Mall and National Museum of Natural History can be seen behind the Castle in the distance. 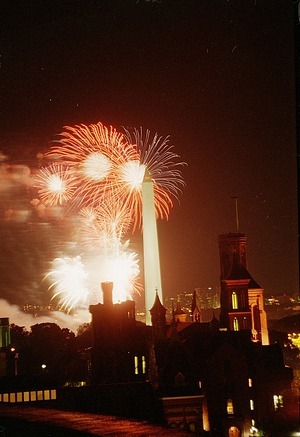 Fireworks going off behind the Washington Monument on the night of August 10, 1996. The fireworks were part of the Birthday Party on the Mall celebration of the Smithsonian's 150th anniversary of its founding. The photograph shows the Washington Monument and some of the towers of the Smithsonian Institution Building.